North Korean general cargo ship Chong Gen capsized and sank in East China Sea on 30 nautical miles southwest off Fukue Island, Japan. The vessel was anchored, but during the night started getting water ingress after hull breach and increase to starboard list. The crew were not able to get control of the water ingress and sent distress signal to the local authorities. The Japanese Coast Guard dispatched rescue boat at the scene of the accident and evacuated all the crew from lifeboats near the sinking ship. The people were transferred to the shore, but salvage was not possible due to high danger for seaworthiness of the ship and her capsizing. 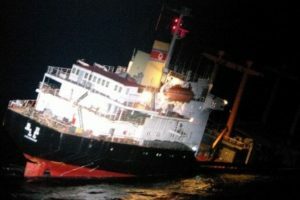 Later during the nigh, the Japanese Coast Guard reported that North Korean general cargo ship Chong Gen capsized and sank. The ship was en route from China to North Korea, carrying cargo of rise. There is no reported water pollution, but area is under monitoring of the local authorities, as during the accident on board of the ship there were several tons of fuel and luboils. The general cargo ship Chong Gen (IMO: 8862155) has overall length of 130.00 m, moulded beam of 18.00 m and maximum draft of 8.00 m. The deadweight of the vessel is 9,430 DWT and the gross tonnage is 6,558 GRT. The ship was built in 1991 by Hambook Shipyard in Pyongyang, North Korea.